October 1912: Entered Army service with assignment to Feld-Artillerie-Regiment Prinz August von Preußen (1. Lithauisches) Nr. 1. 1913: Fahnenjunker in Jäger-zu-Pferd-Regiment Nr. 4. 1914: Commissioned Leutnant. Served during first years of World War I in several capacities including a staff officer. 1917: Transferred to the German Army Flying Service becoming a qualified pilot. 1919-March 1920: Service with the Grenschutz Freikorps against the Poles on eastern German border. March 1920: Separated from the Army. Leased and managed an estate, Marinsee, in the Free City of Danzig cortesy of his marriage to the wealthy Charlotte Ventski of Graudenz. 1 December 1930: Joined the NSDAP. 31 January 1931: Joined the SS. 31 March 1931-9 November 1931: Chief of Staff, SS-Abschnitt II in Chemnitz. 9 November 1931-12 February 1934: Leader of SS-Abchnitt VII in Danzig-Marinsee. December 1933-May 1945: Member of the Reichstag. 15 December 1933-1 February 1934: Leader of SS-Oberabschnitt "Nordost" in Königsberg (included his continued command of SS-Abchnitt VII). 12 February 1934-1 March 1937: Leader of SS-Oberabschnitt "Nord" (later renamed "Nordwest") in Hamburg/Altona. January 1937-February 1945: Chief of the Racial German Main Assistance Office (Volksdeutsche Mittelstelle--VOMI). Upgraded to SS Hauptamt status on 15 June 1941. February-May 1945: Commander of Ordungstruppen (order troops) in rear area of Army Group "Weichsel." 10 May 1945: Captured by the British in Flensburg. Note: Seriously injured in late 1942 in an automobile accident in the mountains of Bosnia while overseeing VOMI evacuation of ethnic Germans from that region. Prussian Iron Cross, 1st Class (1914): 11 March 1918. War Merit Cross, 1st Class with Swords: 30 January 1942. Danzig Cross, 1st Class: 30 November 1939. Danzig Cross, 2nd Class: 30 November 1939. Golden Party Badge: 30 January 1936. After the war, Lorenz was tried with crimes against humanity in connection with VOMI. On 10 March 1948, a U.S. tribunal sentenced him to 20 years' imprisonment; however, he was released in 1955. Lorenz could not understand the charges brought against him and he continually asserted his innocence by claiming VOMI's role was purely humanitarian to provide for the welfare of ethnic Germans. Described by most acquaintances as an honorable and decent gentleman of the Old Prussian school, Lorenz attempted to run VOMI without brutality. 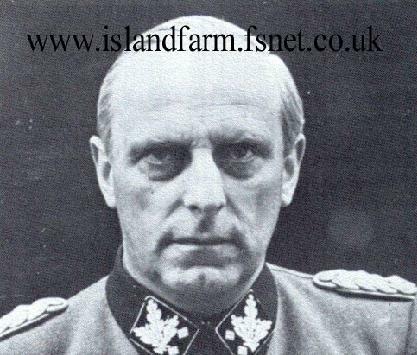 During his war crimes trial, the strongly religious Lorenz claimed his ruthlessly ambitious and career-oriented chief of staff--SS-Gruppenführer Dr. Hermann Behrends--was primarily responsible for VOMI's excesses. It should be noted that Behrends had already been executed by the Yugoslav government by the time of Lorenz's trial and was, perhaps, a convenient scapegoat since he could not defend himself. The forced settlement of unwilling ethnic Germans--particularly those from Slovenia, Alsace, Lorraine, and Luxembourg--into the Reich. Provisional camp internment for ethnic Germans not possessing the "proper racial traits" and/or political and cultural standards. Those internees attempting to escape from the provisional VOMI housing camps could be sentenced to hard labour or a concentration camp. VOMI was an active accomplice in SS activities involving the Final Solution including forcibly evicting Jews from their homes in Poland so that resettled ethnic Germans could have them. Although officially proscribed, certain VOMI officials used Jewish slave labor for the care and maintenance of VOMI facilities.